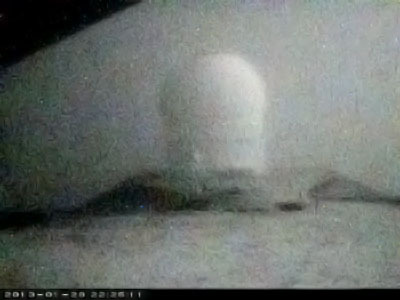 Image of Canada-France-Hawaii Telescope Monday evening (Jan 28). As of 6:30 p.m. Monday (Jan 28) the rangers report the Mauna Kea Access Road is closed to the public at the Visitor Information Station due to snow and ice on the roadways. Temperatures are below freezing, with the humidity peaking consistently over 90%.